New finds from Trench 2, context C205 include burnt and unburnt animal bone and teeth, charred cereal grain, burnt hazelnut shell, charcoal, pottery sherds and a possible loom weight or net sinker. The pottery recovered derives from two different vessels. The first is a coarse pot for which we have four refitting sherds, which seems to have been badly affected by heat. The vessel has rounding to the base. The other single sherd is from the rim of a pot and has finger decoration. Digital images of the pottery sherds will be included with the next news update. 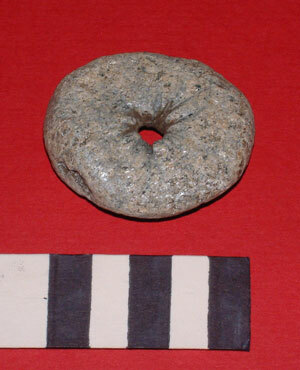 The other find is possibly a loom weight (weaving) or a net sinker (fishing). 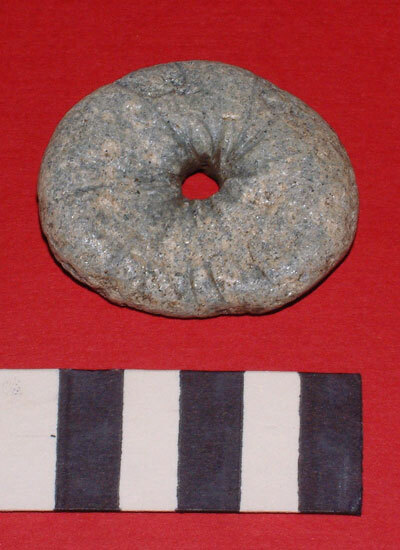 Manufactured from a piece of the local Durness Limestone, the item is rounded and has a small hole through the centre. Lines radiating from the hole and around the rim are probably from attachment to twine, this having cut into the stone through time. This may have been an heavily curated item based on the wear patterns in the stone. The images here show both faces of the possible loom weight or net sinker. Note the grooves cut by some form of twine, to which it was attached. If you have any ideas about the possible function of this artefact, please post your comments. Most of the small finds such as charred grain and burnt hazelnut shell were recovered from the fine seive residues and flots. We found that when we run a magnet over the resulting stone residues from seiving we recover small fragments of crushed ore rock (magnetite?) and hammer scale. This suggests that the prehistoric inhabitants of the High Pastures site were smelting and smithing at the site, for which we hope to find further evidence later this year.